The previous episodes described the drawing processes and experiments applied to get to the final fruit drawings of walnuts, figs, and damsons. This episode went straight to drawing. The concept was clear: rounded well defined fruits contrasted with the spiked branches from whence the quince sprouted. 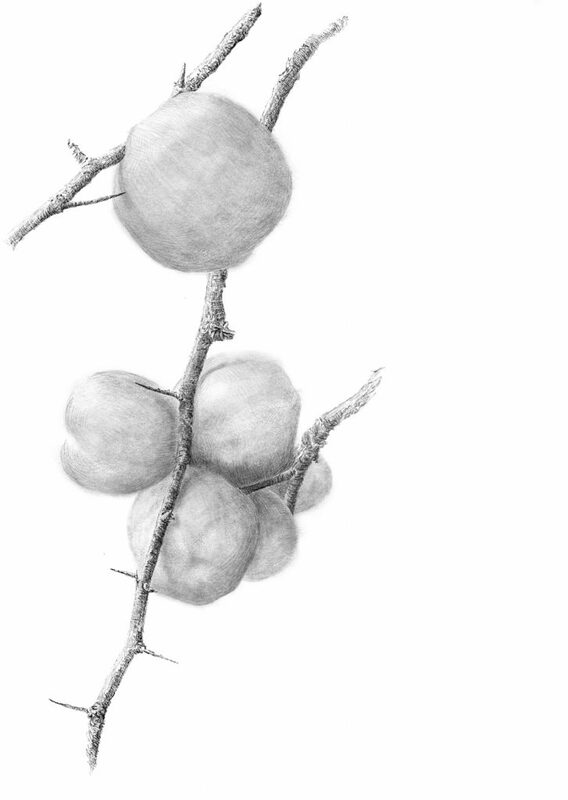 Simple and effective drawing methodology for another exotic fruit from a British Midlands garden. There is however, a unique rationale to this drawing. It is the first drawing I have made since I underwent a surgical removal of two parts of vertebra from my neck. The operation was Cervical Decompression and was performed by Surgeon’s at Queen Elizabeth Hospital Birmingham under Spinal Surgeon Mr S Metcalfe following consultation by the Neurology Department led by Dr E Littleton. The posterior surgery was performed to address the growth spur in vertebrae 3 and 4 to stop its compression of my spinal chord and the subsequent pinching of my nerves from shoulders to finger tips causing piercing pains throughout, with numbness and pins and needles in both hands. I am recovering from this traumatic experience and thankful that I am progressively overcoming the pain of the operation and making this drawing has come as a relief and pleasure.